David is a pioneer in the development of alcohol fuel and waste to energy solutions. He is a featured content provider and consultant on the movie PUMP and will be in Santa Fe for the opening of the Film and for a Q&A on how we can end our dependence on toxic and costly fossil fuel while we create a new energy paradigm and transform the global energy matrix. 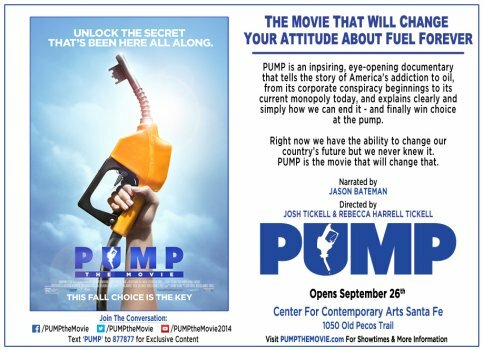 PUMP is an important new movie that shows how YOU can help end our oil addiction, change the rules of the game and open the market to cleaner, cheaper, American made fuels. and join David Blume in-person Friday the 26th for this important event.